Today marks the first official day of Fall and that means that race season is coming up. I have been training a pretty high volume of hours this year and now is the time to drop the volume and increase the intensity. After several 20+ hour weeks of training this week was only 15 hours. I kept the frequency of workouts the same but instead of 2.5 hour I might only run for 1 to 1.5 hours. It felt great. My decrease in hours timed well with the Surly Trail Loppett 1/2 marathon. The loppett events are awesome, and become even better because I can walk to the start from my back door. I actually ran and picked up our bibs during for my pre-breakfast 15 minute jog. After starting slowly I worked my way up to the group racing for 3rd place. At mile 10 my legs left me and I dropped off the 1 hour 22 min pace and the other two guys in our group. I ran it in at 1:25:30 which is still a time I am happy with. The race has grown in the last few years from under a hundred participants to selling out at 900 participants which is pretty cool. 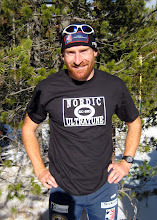 There are some strong runners in the group to push the cross country skiers including race winner and former Team USA Minnesota athlete Chris Lundstrom. It was nice to have an easier week with a busy weekend. On Friday and Saturday, Caitlin and I helped customers at the Hoigaards huge annual tent sale. Hoigaards is one of our new sponsors and they had a great sale weekend. It was a blast to see and meet so many skiers, plus they had some fantastic deals.